Often called the miniature of Africa, Cameroon is a complex country with an incredible diversity of cultures, ethnicities, climate and geography. Mountains, deserts and jungles coupled with intense, humid heat all year around contributes to the heady mix tropical existence and a people for whom confrontation and aggression are never far from the surface. In addition the mix of Anglophone and Francophone colonial heritages made it a truly unique experience for the Footsak team, lost us a couple of kilos in weight and some threatening episodes. This a land of soccer often a panacea for abject poverty and political upheaval but also the vent for passion, spirit, endeavour and pride. We encounter Mama Eto’o iconic symbol of the countries adoration for Samual Eto’o one of the greatest players of the day. In full Indomitable Lions regalia she walks many kilometers a day selling Eto’o and Lions paraphanalia and is the darling mascot of this soccer crazy nation. Her counterpart Ngando Pickett is a familiar television personality who follows the national team to all their major international engagements. The Footsak team filmed these two arger than life characters and did extensive interviews trying to forge the link between soccer and the game of life in this cauldron. A street soccer game was refereed by none other than Marie Vivian, the only FIFA qualified referee in Cameroon whose off and on the field character defies and challenges male dominance. 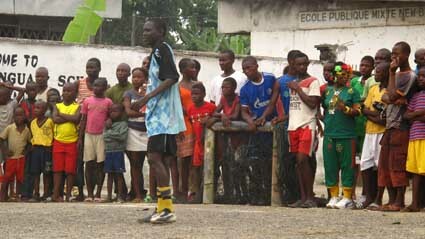 Street soccer is said to be the impetus that gave Cameroonian soccer its noticible style and resulted in its meteoric rise.